A palette generator made for Bitsy (a wonderful tiny game engine developed by Adam LeDoux) but usable by all. 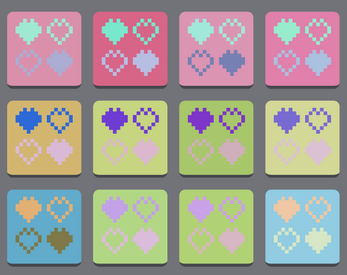 Each palette you click generates a new generation of palettes based on the one you selected. Really brilliant idea. Gonna be using this, thanks! The magic of CSS transitions! This is how I'm making my Bitsy palettes from now on. It would very useful and encouraging to have a contrast requirement to generate accessible palettes. Let me know if you make anything cool with it!